Chickpea Recipes – Chickpeas Recipe -Garbanzo Bean Recipes | Cook Eat Delicious! 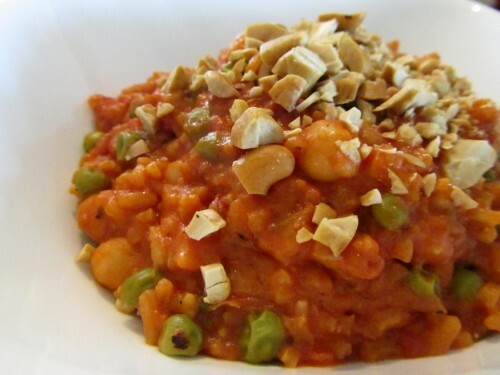 Chickpeas, also known as Garbanzo Beans, are a great source of Protein and tasted delicious. Chickpeas can be added to salads for some texture and to up the flavor profile. Chickpeas or Garbanzo beans are also the base for Hummus. Add in some other simple ingredients to cook up the easy dip or spread of Hummus. Chickpeas are great added to rice and bean dishes or thrown into soups. There are so many recipes to use these beans in. What is your most used chickpea recipe? Turn this ordinary but tasty legume into something extraordinary with our Chickpea recipes. Curry is able to change a simple dish into something dynamic. I used to make a Coconut Rice dish with chickpeas and green peas. Delicious. I decided to mix things up by adding in some red curry paste and tomatoes…can you say, “More Delicious”? Yes, it turned my ordinary Rice & Peas dish into something extraordinary. Delicious Rating: This is a great curry recipe. Again it is a one pot meal, which I am a big fan of because they are usually easy recipes to cook up for dinner. The leftovers got time to blend the flavors and give it more depth which made it taste even better the next day. If you aren’t a big fan of curry, leave it out along with the tomatoes leaving a great coconut rice dish.